New for Kindle! 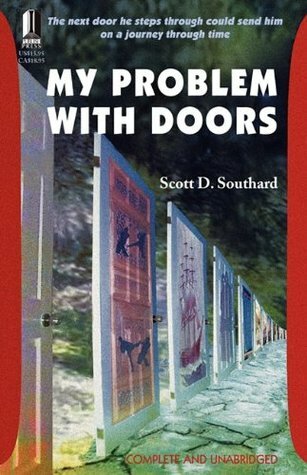 The Time-Travel Adventure MY PROBLEM WITH DOORS Now Available! Book Giveaway! Jacob is lost in time. He has been that way ever since he was a child for doors don’t work for him like they do for the rest of us. A door can take him to the past or the future, into any house, into any country. MY PROBLEM WITH DOORS is Jacob’s plea for help. This novel is an unpredictable adventure filled with thrills, romance, horror, and even the occasional cameo from historical figures like Lord Byron and Jack the Ripper. You can check out an excerpt from the book here. There is also a book giveaway going on for the work over at Goodreads.com. Two lucky readers will win an autographed copy of the novel. You can enter by clicking below. This entry was posted in Books and tagged Adventure, Amazon, autographed copy, Book Giveaway, Comedy, eBook, Fiction, GoodReads.com, Humor, Kindle, Literary Fiction, Literature, New eBook, Romance, Surprises, Sweepstakes, Time Travel, Unpredictable by Scott D. Southard. Bookmark the permalink.